Racks - Go anywhere. Bring anything. enough to accommodate just about every bike. Here are a few of the ones we like. Please call or stop in to see 'em! This might be our favorite all-around touring rack. It's really light, wide, and strong, offers a low-mount pannier position, sits far enough back to provide great heel clearance, and comes with super long stays to accommodate mounting to the smallest bikes. A real winner for the money. Tubus Disco: So, you have disc brakes, and only the best is good enough for you. 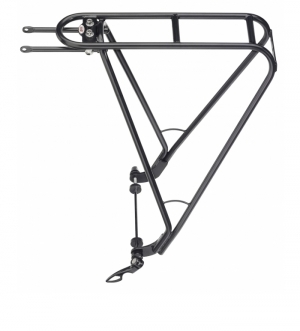 Now, you can mount a tubus carrier on your bike. Our DISCO is available in two sizes and designed to be combined with disc brakes. Instead of using added accessories, the DISCO simply fits onto your frame. 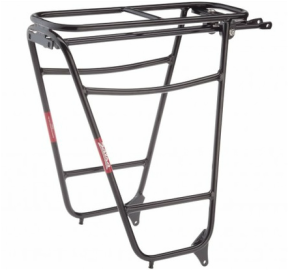 The carrier is easy to mount using the serial quick release, or it can also be mounted on eyelets of the frame. Simply load up your bike and go. Tubus Cargo Evo: It´s a classic - now updated for all modern requirements. The allround carrier has become even better by improving important details now. 3D-feet with perfect force absorbtion and integrated screw attachement. New superlight mountingparts for mounting the stays to the frame. Click springclamp. Rearlight protection by drawn-out tubes. Armed for additional 25 years on the road. We just had to copyclip this straight from the German translation. The Vega - now also as Evo-model - with 3D-feets for perfect force absorbtion and integrated screw attachement. New superlight mountingparts for alternative mounting the stays to the frame. Optional: klick springclamp. Racktime Addit rack integrates with Racktime's bag mounting system, making transitions from the bike to the boulangerie a snap, literally. 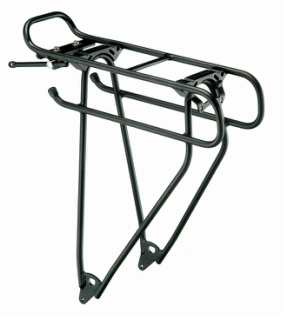 This rack is also suitable for any standard pannier, and even meets the payload requirements for the Yepp Maxi child seat. A versatile winner! The Surly Nice Rack is fully adjustable and fits a wide variety of bikes, including many with disc brakes, fat tires, weird color schemes, and more. Adaptable to many wheel sizes, this stout bugger designed in Minnesota can handle just about whatever you throw at it. The Jandd Expedition Rack is the rack of choice for cyclists who require exceptional durability and expanded size, measuring a full three inches longer than our standard rack. 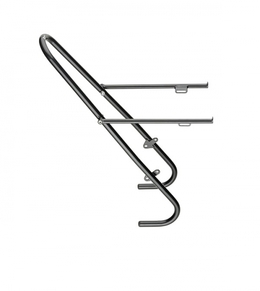 Surly front mount rack. Kinda like the rear but for the front. I know, I know. Seems simple. Well, it is. Stout and tough and sugar and spice. 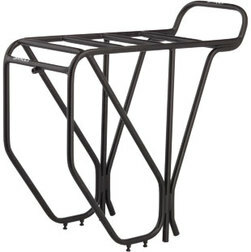 Surly 24 pack rack. It holds at least one 24 pack of whatever: beer, hand grenades, etc. Fits your fork, but really requires crown eyelets. Call us if you don't understand. Cool rack! Tubus Tara front low-rider: The TARA is our longest standing low-rider model. For 18 years it has been our best selling front carrier. It has been improved over time, making it even more solid. This is the most durable Tubus low-rider. Its simple shape and variable mounting allows it to fit to even the most diverse forks. When used in combination with the CARGO, TARA is the perfect match for long travel biking. Separate eyelets for mudguard mounting are also included. For the fat tire section, we also offer the TARA Big Apple. Salsa Down Under front rack: for those of you with forward-facing fork eyelets and mid-blade mounting points, this rack is about as minimal as a front rack can get. Tubular cro-mo, as you'd expect from Salsa. 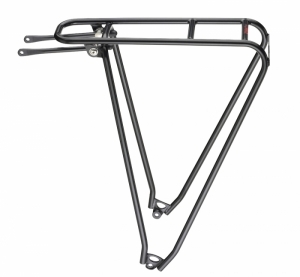 SOMA Lucas front rack: Redesigned with a taller backstop and eyelets for accessories. Perfect for strapping a Wald basket to, or on its own. Stainless hardware, includes mounting tang and spacers so that you can clear the fork leg when you mount to the eyelets on the backside of your fork. Works well with a set of P-clamps as well(not included). Platform measures 240mm x 130mm, eyelet to bottom of rack is 365mm. Greyish silver finish. The SOMA front rack allows you to stack all manner of things on top as well as a set of panniers below. Pretty cool! 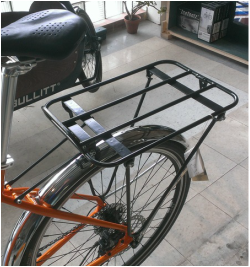 Gamoh Porteur rear rack: a super-wide carrier great for flat stuff or floppy loads that need extra support. One of the widest rear racks on the market. Cargo on!